Dutch artist duo takes 'dicing' to the next level. For a photography special of Dutch newspaper De Volkskrant, Lernert and Sander transformed unprocessed food into 98 perfect cubes of 2,5 x 2,5 x 2,5 cm and take 'dicing" to the extreme with a surprisingly cool effect. The duo has been collaborating since 2007 and they are known for their stunning projects. To check more of their work, visit their website here. Meccano Home: From educational toy to real furniture! Now you can enjoy Meccano as a grown up and build your own super sized furniture. Meccano Home is sold both as individual parts and in prepackaged sets, so check Meccano Home out here and start constructing! London artist Nick Smith created incredible quasi-“pixelated” versions of famous art masterpieces, using only Pantone swatches. Meet d3, the launch of Dubai Design District. Meet d3 was a pop-up event to introduce Dubai Design District to the public. Dubai Design District or d3 is said to become the new hub for all creative industries. On April 2nd, the &storm team went to check out this new hotspot. Meet d3 offered a selection of edgy fashion boutiques, funky art installations and street art performances, food trucks and cool restaurants for the foodies and a huge stage with live music and DJ's. Click on the photo to see the rest of the photo gallery. Monday the 30th March, the evening before the big conference day, Freshly Ground Sounds organised a mini music festival to kick off STEP Conference 2015. STEP conference is the most disruptive event for technology, design, and gaming in the Middle East. The &storm team happily attended this charming festival in Dubai International Marine Club. There were up-and-coming music bands, street style food trucks and cool activities. STEP knows how to create something new to the region over and over again. This time they came up with a European inspired, boho style, outdoor music event to kick off the conference of the next day. Amazing job! &storm wishes you all a happy 2015! Bristol-based designer and creative director Jonathan Quintin turned quotes from clients into this hilarious poster collection on Behance. Check out more of his work here. We are proud to announce new additions to the &storm family. Insanely talented Japanese artists turn drinking straws in to colourful mind-blowing pieces of art. You can find themes like mythical creatures, insects and superheroes. One superior talent, known only as TAO, is famous for his incredibly ornate dragons. Pumptone is a concept that art director, graphic designer and illustrator Christian Goldemann wishes to produce in cooperation with Pantone Universe and famed shoe designer Christian Louboutin. It is not (yet) an officially licensed Pantone Product, nor is it available for sale. Too bad...because we think they are awesome!! 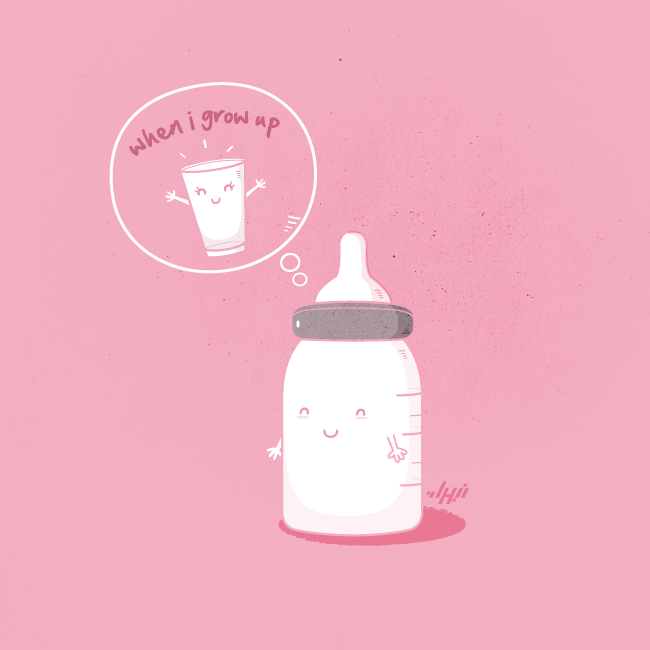 Today we stumbled upon the work of Nabhan Abdullatif. He is a Visual Artist, Graphic Designer and Illustrator, based in Oman. He creates hilarious visual puns by combining cool illustrations of everyday objects with witty captions. Check out some of his work below or follow him here. George Rigby, Jennifer Hardy and Stephen Tucker from Bournemouth University spent eight months on the production of their graduate animation ‘A New Hue’. They created a story of a paper girl that discovers a fascinating world of colours with the help of a blob of ink, named ‘Blot’. &storm is going pink for October! Check out the work of Laces Out Studios, that turns a pair of simple canvas shoes into a little pieces of art. Hand painted with fabric paint and permanent markers, Laces Out Studios spices up your shoes with pop culture designs, like Calvin and Hobbes, Robin Hood, Pink Floys and many other. Want to know all about how important color is within design? Read this interesting article from Luke Clum, a Seattle based graphic designer and web developer. 'Cupidon', animated short about a naughty Cupid. 'Cupidon' is an animated short about an adorable but very naughty Cupid, directed by Simon Bau, Clémentine Choplain, Marie Ecarlat, Benoît Huguet and Julien Soulage. Original soundtrack by Damien Deshayes. 271 years before PANTONE introduced the color matching system, Dutch artist ‘A. Boogert’ wrote an amazing book about mixing watercolors. The book, "Traité des couleurs servant à la peinture à l’eau", was discovered by book historian Erik Kwakkel. It has been described by Colossal as “probably the most comprehensive guide to paint and color of its time,” closely resembling the modern day PANTONE color guide. To view the complete book click here. Recently we added photography and styling to our services. Here a sneak peek of what we are working on at the moment. We will add the results to our projects soon. &storm is currently working on a new project that has to be environmentally friendly. So while doing some research on eco design, we stumbled on this amazing work from Eduardo Alessi. His Eco DIY Collection uses recycled cardboard as structural material and all items are cut from a single sheet paper to save material for production. Some of them are electric products, designed to be energy efficient without using batteries. Once the products have been mounted they look like 5 different endangered species of animals to raise awareness. We love them all!